I think Buckwheat pancakes work great as a savoury meal. 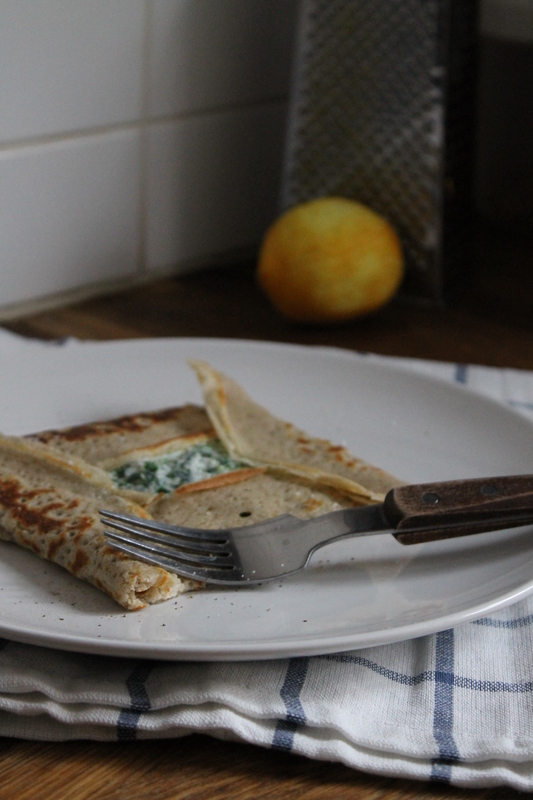 Using buckwheat flour gives the pancake a slightly heavier texture than your standard crepe, with a robust and earthy flavour that tastes delicious. 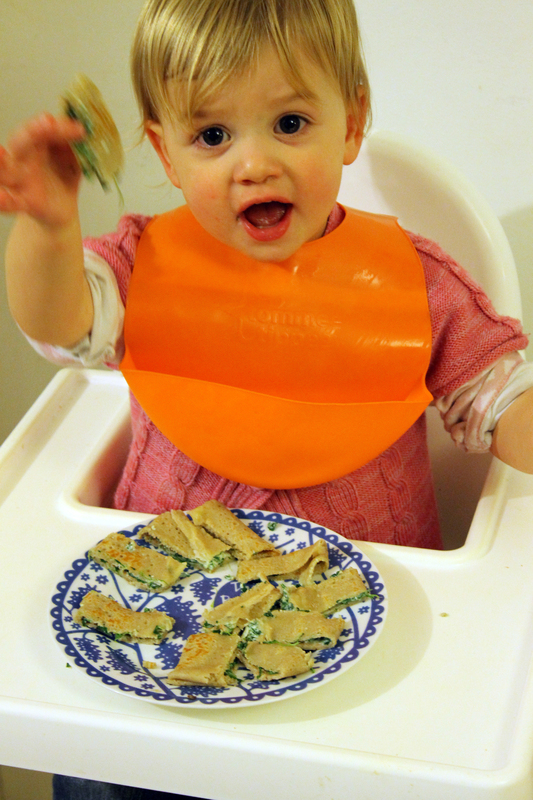 A traditional pancake from Northern France, these galettes de sarrasin are quickly cooked in the pan for a minute or two, served with a filling of your choice and folded into a neat parcel, perfect for little fingers. I particularly like them with this Spinach & Ricotta filling. Buckwheat is really good for you, it’s packed full of protein and essential minerals. In spite of the name there is no ‘wheat’ in buckwheat, it is actually a fruit seed related to rhubarb, which makes it a perfect wheat and gluten free alternative. Doves farm makes the flour which you’ll be able to find online or in Waitrose. With Shrove Tuesday coming up in a few weeks time you should give Buckwheat pancakes a go, if not before! Start by making the pancake batter as it will need to rest in the fridge for at least 1/2 hour. Put the flour and a pinch of salt in a large bowl and create a well in the centre. Add the beaten eggs in the centre and pour the milk in gradually whisking to incorporate the flour as you go. Whisk until you get rid of any lumps. Finally stir in the melted butter. Cover with cling film and leave to rest in the fridge for at least 1/2 hour. Wilt the spinach in large pan on medium heat. Remove from the heat once cooked and transfer to a sieve. Use a wooden spoon the push out excess water. You don’t want the spinach to be too watery. Place on a chopping board and chop thinly. In a bowl add the ricotta, nutmeg, parmesan, lemon zest, and cooled spinach and mix. Once the batter has rested you are ready to make the pancakes. You might want to tun the oven on to keep the pancakes warm if you are not eating as you make. In a non-stick frying pan heat some vegetable oil on medium to high heat. Once hot, soak up excess oil with a kitchen towel, beware not to burn your fingers! Pour a ladle full of batter and tilt the pan distribute the batter evenly. Cook over a medium heat until golden and turn the pancake over using a spatula. At this point add a spoonful of the ricotta mixture to the middle of the pancake whilst the other side cooks. For the adult portions, season with salt and pepper at this point.You want to slightly flatten the mixture using the back of a spoon into a square. Check the other side and once golden, fold each side of the pancake into the centre, just allowing a little of the filling to remain visible. The pancake batter may get slightly thicker as you are making the crepes so you might want to loosen it slightly with a little extra milk if that’s the case. For my daughter, I folded the pancake slightly tighter and just cut it in finger friendly ‘little soldiers’.